Off the Starting Block: Red-shirt junior Zach Dumas goes for a block during an exhibition. Both Aggie basketball teams will tip-off their seasons on Nov. 10-11. 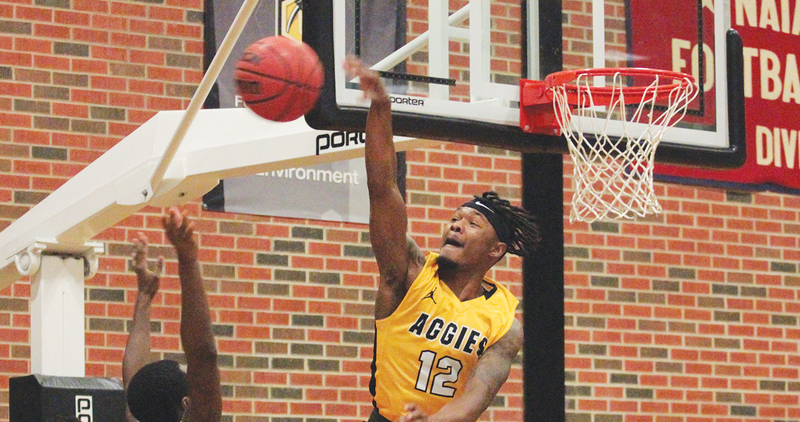 The Cameron basketball season tips-off on Nov. 10-11 as the women’s team opens on the road in Wichita Falls, Texas, and the men in Wichita, Kansas. The Aggie women will debut against Oklahoma Christian on Nov. 10 and Colorado Mesa on Nov. 11 in Midwestern State’s D.L. Ligon Coliseum. Last season CU went 11-16 overall and 9-11 in Lone Star Conference play. That finish resulted in CU’s seventh place in the league’s preseason poll, one spot ahead of their finish in the standings last season. The Aggies had the second highest scoring offense in the conference last season, finishing the year averaging 78.5 points per contest. However, with the loss of their top three point guards, CU may be forced to slow the game down and play a different style of ball. Their top returner, Jamie Bonnarens, averaged 14.4 points and 5.7 rebounds per contest while shooting over 42 percent from the field. Joining Bonnarens are five returners, including three point specialist, Ava Battese, who averaged 7.7 points with a three point percentage of .373. A trio of transfers in Amaka Nwakamma, Sydney Ellis and Lejha Smith also join the squad. Four true freshmen will help add depth to this year’s team. Oklahoma Christian is sixth in the Heartland Conference preseason poll after finishing last year with a 15-14 overall record and a 10-6 league mark. They return Addy Clift, a preseason allconference selection who was top-20 in the nation in three point shooting while averaging almost 15 points per contest. Other key returners for OC are Audrey Hayes, Megan Shelton and Hope Dawkins. Colorado Mesa is fourth in the Rocky Mountain Athletic Conference at the start of the season after finishing last year with a 21-7 mark and a 17-5 RMAC record. Top returner Erin Reichle is on the AllRMAC preseason team after averaging 13.2 points, 4.1 assists and 3.8 rebounds last year. Also returning is senior center Ma’ata Epenisa, who was an All-RMAC honorable mention and averaged 10.2 points and 4.9 rebounds last season. The Aggie men open their season at the Heartland/LSC Challenge to face Newman on Friday and Oklahoma Christian on Nov. 10-11. The Aggies return three starters from last season and have three more players who played significant minutes during the 2016-17 season. Tyus Momoh, JV Long and Tyler Williams return for their junior seasons after they each averaged more than 10 points per contest. They are joined by fellow returners Jalen Nicholas, Jordan Lewis and Elish Benjamin. Cameron will also have three red-shirt players, including Johann Tate and Delano Jones, three transfers, including senior forward Bryce Elie and true freshman Trent Crow, who is expected to redshirt, all on the roster this season. The Aggies are eighth in the league preseason poll, four spots behind their finish in the conference standings at the end of the 2016-17 season. Newman is coming off of a season where they went 9-19 overall and 7-11 in Heartland play. NU’s top returning scorer from last year, Allen Wilson, averaged 6.6 points in 18.3 minutes of action. Oklahoma Christian returns one of their top-3 scorers in Elijah Strickland from a team that went 8-18 last season and 3-15 in the Heartland. Strickland averaged 11.5 points per contest a year ago and made almost 90 percent of his free throw attempts. He will be joined by Miroslav Jaksic, a 6’11” senior from Ontario, Canada, who went 13-15 from the field for 26 points in the Eagles exhibition win over Randall; Strickland added 17 points in 11 rebounds, while juco transfer Roderick Smith had 11 points and 11 rebounds.